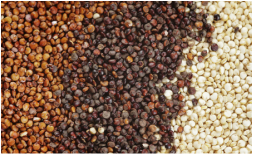 QUINOA (PRONOUNCED KEEN-WA) WAS FIRST CULTIVATED IN BOLIVIA THOUSANDS OF YEARS AGO. TECHNICALLY IT IS NOT A GRAIN BUT A “PSEUDO-CEREAL”. BOTANICALLY IT IS RELATED TO BEETS, CHARD AND SPINACH. IT IS GLUTEN FREE AND AN EXCELLENT SOURCE OF IRON, MAGNESIUM, VITAMIN E, POTASSIUM AND FIBER AND CONTAINS EVERY AMINO ACID. 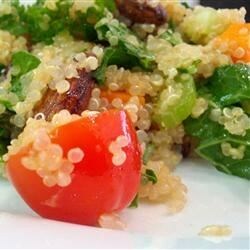 Quinoa seeds have a naturally bitter coating that must be soaked off before cooking. 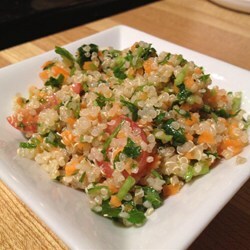 To cook: soak 1 cup quinoa in 2 cups of water for 5-10 minutes, drain and rinse. Pour the quinoa into a kettle with 1 ½ cups water and ½ tsp salt. Boil, cover with a tight fitting lid. Simmer for 15 minutes. Remove from heat and let sit for 5 minutes covered. Fluff with a fork and serve. It can be eaten on its own as a side dish, with a bit of butter or oil, salt, pepper or other seasonings. It can also be mixed with dried fruit, cinnamon, and milk. It can be substituted for rice. It can be used in baking or salads. 2 cups water or vegetable broth - bring to boil - add 1 cup quinoa and pinch of salt. Feta cheese can to added or served with the salad for those who enjoy the cheese flavors. Place all ingredients in a covered bowl and place in fridge. place of any of the other beans. Can be in the fridge for one week. Sliced avocado can be added when served. 1 ½ cups uncooked quinoa, rinsed and cooked in 3 cups of water. Bring to boil over medium heat for 5 minutes. Turn the heat to low and simmer for about 15 minutes, or until water is absorbed. Remove from heat and fluff with a fork. Set aside. In a large skillet, heat olive oil, saute onion and garlic until softened. Add spinach and cook until it shrinks down. Stir in artichoke hearts. Season with salt and pepper to taste. Turn off heat and set aside. In a medium saucepan add 3 Tblsp butter and flour and heat over medium heat. Form a paste and whisk in milk. Stir in cream cheese and ½ cup shredded mozzarella cheese. Whisk until smooth. 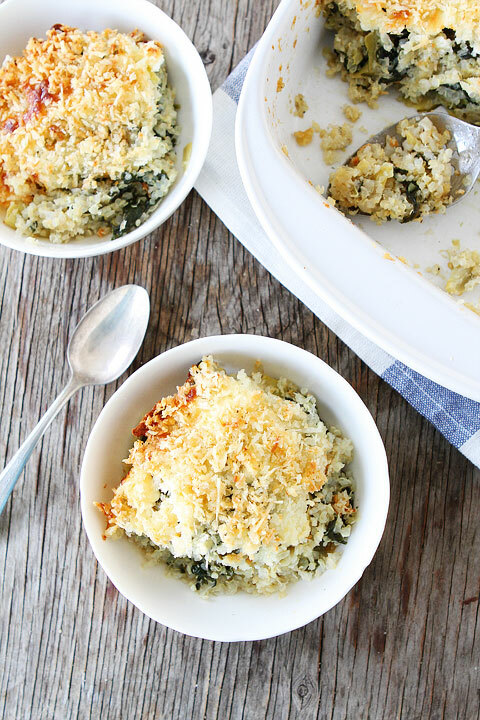 In a large bowl combine quinoa, spinach & artichoke mixture and cheese sauce. stir in remaining 1 cup of mozzarella cheese. Pour into baking dish. Top with feta cheese. For topping: combine melted butter, bread crumbs, & Parmesan cheese in small bowl. 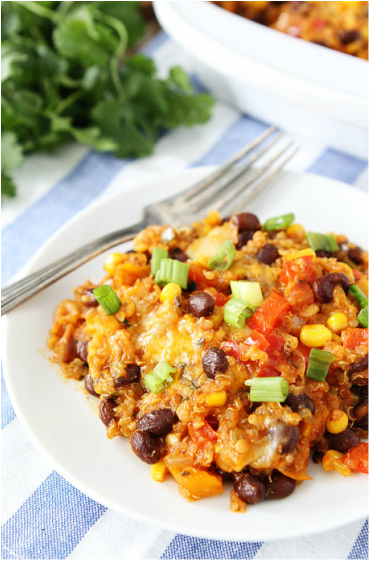 Sprinkle over quinoa bake. Cover pan with aluminum foil. Bake 20 minutes. Remove foil & bake for another 15-20 minutes or until top is golden brown. Serves 8-10 This can be made vegan but substituting vegan cheeses and sauces. 1 ½ cups uncooked quinoa, rinsed. Add to 3 cups water in a medium saucepan. Boil for 5 minutes and simmer for about 15 minutes, or until water is absorbed. Remove from heat, fluff with a fork and set aside. Preheat oven to 350 degrees F. Grease a 9X13 baking dish with cooking spray. In a large skillet, heat olive oil and saute onion, garlic and jalapeno until softened. Add in peppers and corn. Cook for 3-4 minutes. Add lime juice, cumin, chili powder and cilantro. Stir. Season with salt and pepper, to taste. In a large bowl, add the cooked quinoa & black beans. Add the sauteed vegetable mixture and stir to combine. Pour in the enchilada sauce and stir. Add ½ cup shredded cheese. Pour into baking dish. Top with remaining cheese. Cover the pan with foil. Bake for 20 minutes, then remove foil. Bake an additional 10 minutes, or until cheese is melted and edges are bubbling.